"For a writer, his portrait is the only link he can establish with his readers. When we read a book whose content moves us, we are interested to look at the author's face, which is generally printed on the jacket since the publisher is aware of our wish to see if these features correspond to the idea we have formed of the author. This image is thus very important to the man of letters. He prefers a photographer in whom he can have confidence" (from Gisèle Freund: Photographer, 1985). In 1977, German-born French photographer Gisele Freund (c.1908/12-2000) revisited portraits of ten men and women of letters, who originally sat for her in 1938-1939, for an edition limited to thirty-six copies of her work, Au pays de visages. 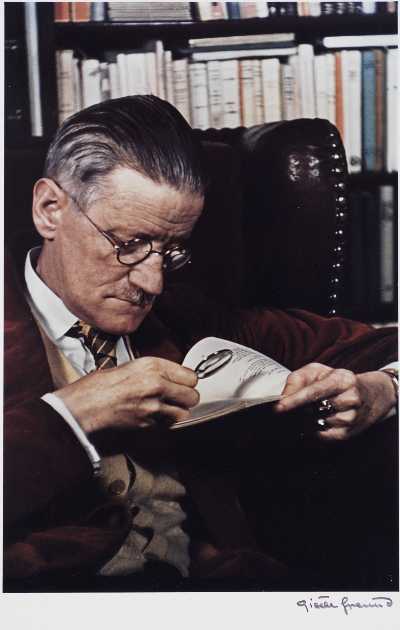 The writers were Colette, Virginia Woolf, André Gide, James Joyce, Jean Cocteau, Simone de Beauvoir, Jean-Paul Sarte, André Malraux, Vita Sackville-West, and Silvia Beach's companion, the poet, publisher, and proprietor of the famed bookshop La Maison des Amis des Livres (1915-1951), Adrienne Monnier. Freund printed the portraits using the dye-transfer process developed by Technicolor in 1928 and refined by them in 1932. Labor and time intensive, the process results in extraordinarily beautiful hues that can be hotly vivid or possess muted richness as no other; it is intense. Color photographs using the dye-transfer process are instantly recognizable as such, as are movies photographed in Technicolor. Gisele Freund was born into a Jewish family in Schöneberg, near Berlin. In 1928, her father bought her a Leica. She liked it and pursued photography as a hobby while studying sociology and literature. Some hobby: when the Nazis came to power the Freunds left Germany with Gisele smuggling out the portraits she had made of Hitler's political victims. She studied at the Sorbonne and played chess with Walter Benjamin, who, while she was writing her dissertation, La Photographie en France au dix-neuvième siècle, at the Bibliothéque National, was also there, writing a study of Baudelaire. 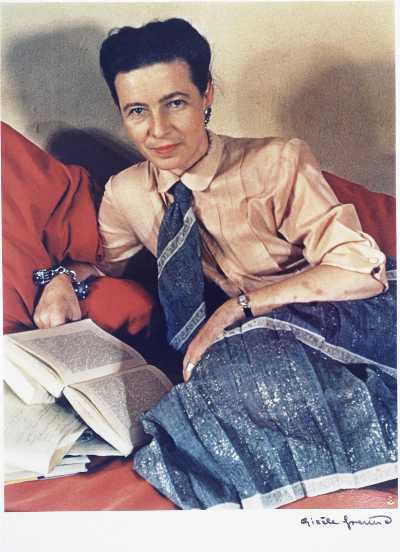 Her dissertation was published by Adrienne Monnier, who, along with Sylvia Beach, introduced Gisele to Paris' literary circle. 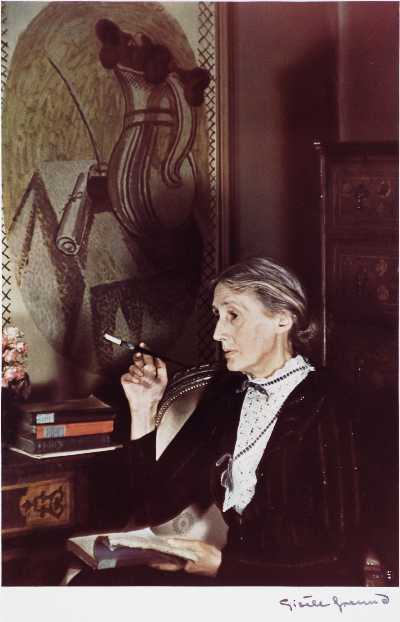 Virginia Woolf, in her London house, 1939. She never saw the portrait, and later called Gisele a "devil woman." After the war, Gisele worked as a free-lancer for Magnum Photos. Legendary photo-journalist Robert "if your photographs aren't good enough you're not close enough" Capa, who had co-founded Magnum, told her "If you want to make money, give up your job as a reporter. It will earn you a good living, but you'll never get rich." 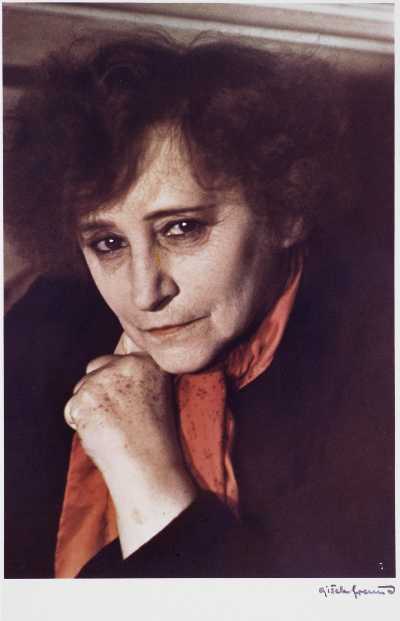 During the 1970s, Gisele Freund toured Japan, the Near East, and the U.S., where, in 1977 K&S Laboratories in Chicago printed these great portraits, amongst the many dye-transfer photographs she took of writers and artists in pre-war Paris. FREUND, Gisele. Au pays des visages. Washington D.C.: [Harry H. Lunn Jr], 1977. One of thirty numbered copies of a total edition of thirty-six. Folio. Ten original dye transfer photographs, each signed by the artist in ink, and each loosely mounted (with hinged corners) on large rag mats. Images courtesy of Ars Libri Ltd, currently offering this title, with our thanks. Thank You very interesting post.